Kellie: It's not very bachelor-friendly packaging. The cooking directions actually instruct you to completely thaw the sandwich before placing it in microwave. What's more, you're supposed to remove the sandwich from its plastic container and wrap it in a paper towel. Kellie: It doesn't really fit in a standard-sized paper towel. Mr Breakfast: It's a fairly large sandwich. We examined the sandwich after removing it from the microwave. Mr Breakfast: Would you call this an attractive product? Kellie: Hmmmn... I wouldn't call it attractive, but I wouldn't call it scary. It looks kind of like it does on the box. At this point, we got down to the business of tasting. Laura: It's a decent attempt at recreating a fast food product. Kellie: Uh oh - part of my egg is cold. It didn't cook too evenly. Mr Breakfast: The English muffin is a little weird - like it can't decide if it's dry or moist. Kellie: But for a microwave bread product, it's pretty good. Mr Breakfast: The egg tastes like regular egg. Kellie and Laura: It does. Laura: It's little more spongy. Mr Breakfast: How would you compare this to an Egg McMuffin sandwich from McDonalds? It doesn't really even compare. Kellie: It would be a good replacement. Laura: But it'd be frustrating as hell, because you'd have to defrost it. Mr Breakfast would like to thank Kellie Dancho and Laura Martin of Los Angeles for their help with this product review. 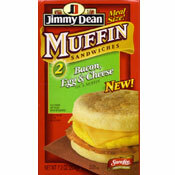 What do you think of Jimmy Dean Muffin Sandwiches? Getting tired of biting into something hard in the sausage sandwiches & having to spit it out. Pieces of bone or something. I love sausage, but won't buy these anymore. The bottom piece of English muffin is hard after microwaving. I like to bring the sausage, egg and cheese biscuits with me to work. I put the individual package in my lunchbox and my the time I get to the office, it is thawed. I take the sandwich apart and toast the biscuit in the toaster and put the sausage, egg and cheese portion in the microwave for a minute, then reassemble everything. It only takes an extra second or two but the taste of the sandwich is far superior to microwaving the whole thing. The biscuit comes out flake not chewy or soggy. Try it! Horrible packaging and not much better tasting. Getting it out of the package and the multi-step microwave instructions are too much work for me first thing out of bed. Re: Sausage egg & cheese sandwich. Sandwich was good but the top bun fell off and the sandwich was crumbly all over. I love the breakfast sandwiches and bowls. Especially those with turkey sausage since I don't eat pork. Great hot breakfast in a pinch. One suggestion for the sandwiches with egg & cheese. Put the sausage between the egg and cheese. Putting the egg and cheese together makes the sandwich slide around when you bite it. Other than that... good job! Healthier than McD's and if defrosted it fills in a pinch for a real smaller breakfast. It smells very bad and looks gross. All you have to do is take it out night before and let it thaw out. Boom! Put in mic for 50-60 sec and it's done perfectly. Do not mic frozen! Waiting at the Airport I purchased a Jimmy Dean Bacon, Egg, and Cheese Biscuit. It was fantastic. My sister bought the ham, cheese and egg biscuit. I tried it also. I cant wait to get to the grocery store to get more. What a great sandwich!!!! We were pleasantly surprised by the Sausage/Egg/Cheese Muffin Sandwiches. They beat McDonald's by a long shot. The only problem we encountered was the cooking time in our microwave was considerably longer than suggested on the box. Who cares? It was quick, easy and tasty. I think these taste pretty good! If you make sure you follow the directions (napkin and defrost) and then do not overheat it then it tastes really good! I am excited to try it with the recommendations of taking it apart and toasting the muffin. Thanks! I get the sausage, egg, and cheese. I think they are fantastic. I take one out frozen solid and open it up. I take the slice of cheese and fold it or break it up so it won't melt over the edge. Nuke it a bit and then I turn the sausage patty over. Heat and then put the halves together. I find this is exactly like a deli breakfast sandwich. Looks like people either hate it or love it. I love it! I love them found out the secret for me is to take it apart (might have to micro it for 10-12 seconds to get it apart) I then toast my muffin in the toaster and put the rest on a saucer and micro it for about one minute and then the muffin is not chewy (you can toast it as brown as you like) and it is great. Buy the sausage , egg & cheese sandwich... follow instructions and you'll get a great quick breakfast sandwich... thawing overnight in fridge is the secret. As a long-time customer that has enjoyed the Biscuit Sandwich, I was delighted to see your new D-Light turkey sausage sandwich, that is until I tried one. It was impossible to microwave satisfactorily. The egg filling consistantly ended up as a piece of rubber. I struggled through six of themand threw out the balance. Thie biscuit seems to be the problem. I recently purchased a box of 6 egg, canadian sausage and cheese sandwiches and the bacon was so tough, I had trouble tearing it apart in edible pieces. I had previously purchased the same sandwich except with sausage and those have been good. This is the nastiest breakfast sandwich I have ever tasted. 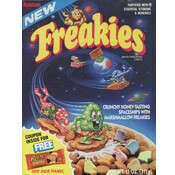 I have spent the last hour appoligizing to my husband for giving this to him for breakfast.